TRRC’s most recent report (published March 2018, with estimates through December 2017) is consistent through January 2017 with production estimates in the PSM, but, after January, the two sources diverge. 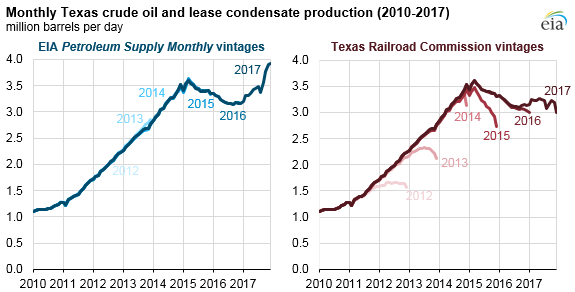 This divergence increases for more recent months: EIA’s most recent production estimates for Texas, published in the PSM on February 28, 2018, show Texas’s crude oil production reaching 3.93 million barrels per day (b/d) in December 2017. TRRC’s values show production at 2.99 million b/d in that same month. EIA develops state-level production estimates for Texas based on its EIA-914 survey. The EIA-914 survey for oil production was established in 2015, in part to make up for the deficiencies of estimating based on initial state agency reports. 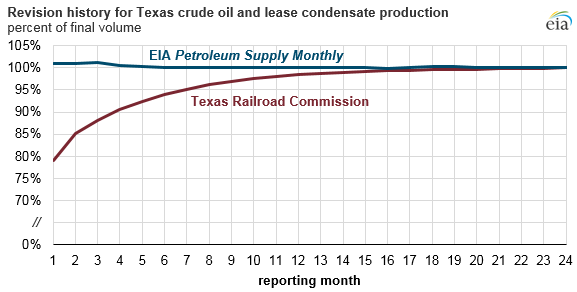 EIA monthly oil production volumes are different from the Texas Railroad Commission volumes initially, but as time passes, these differences diminish as TRRC updates and revises its data. EIA's methodology anticipates and accounts for these expected revisions. Because EIA’s methodology anticipates revisions, PSM estimates are generally consistent across vintages of data releases, meaning they do not show large revisions as later reports are issued. By contrast, TRRC estimates are consistently revised upward as later reports are issued. The TRRC data are revised upwards over a period of one to two years. From January 2012 through December 2015, the change in TRRC estimates for any single month has varied from 10% to 31% from month 1 to month 24, with a 12-month average increase of 21%. For the month of December 2017, the TRRC data are 24% below the current EIA estimate. TRRC's initial reports tend to be low relative to EIA’s PSM because some oil and natural gas operator reports are placed in a pending file while waiting for other state reporting requirements to be satisfied. Reports may be filed late or have other discrepancies to resolve. Once resolved—generally these resolutions take up to two years—these reports are ultimately included in TRRC's published reports. On average, TRRC’s published reports are within 95% of their ultimate value after seven months. Most likely, by late 2019, TRRC’s published production value for December 2017 will be about 3.93 million b/d, consistent with EIA’s most recent PSM estimates. As TRRC continues to revise its data over the next year, we expect the discrepancies observed for the months of 2017 to fall to negligible levels. Texas is not the only state with incomplete initial monthly data. 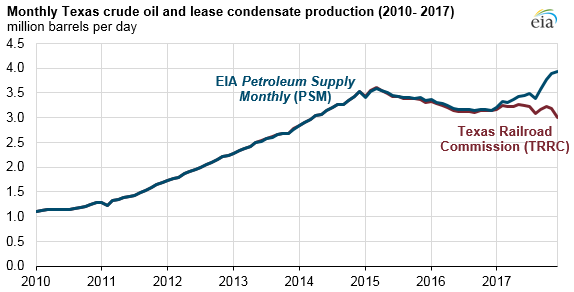 A full explanation of EIA's approach for estimating crude oil production in Texas and other states is available in EIA's methodology report for the PSM.